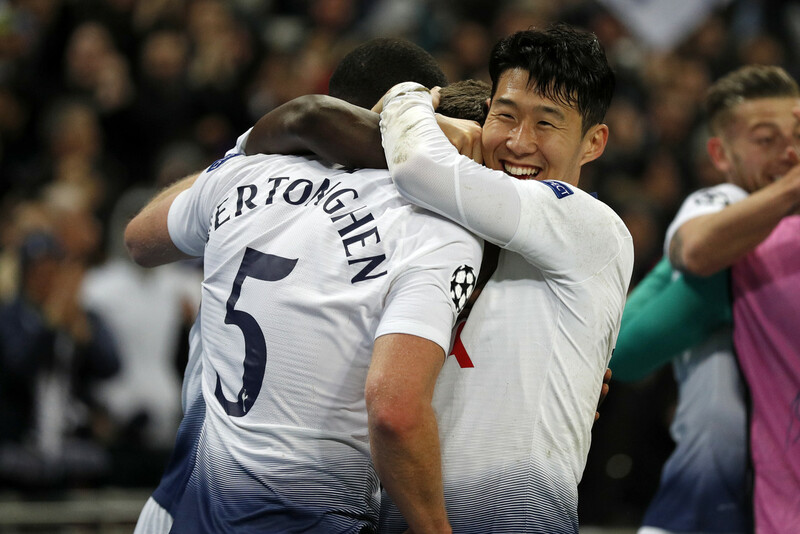 Tottenham Hotspur&apos;s South Korean forward Son Heung-Min was the star as a second half blitz saw the Londoners beat Borussia Dortmund at Wembley, while a late goal saw holders Real Madrid claim a win against a spirited Ajax side. After a back-and-forth first half inside Spurs&apos; temporary home in which English teenager Jadon Sancho impressed in the black and yellow of Dortmund, Tottenham didn&apos;t waste time to make their mark once the second half of the round of 16 first leg kicked off. Mauricio Pochettino&apos;s side began the second 45 minutes with much increased tempo and would soon break the deadlock as a wonderful cross was whipped in from the left flank from Jan Vertonghen and, after correctly anticipating that Dortmund&apos;s Dan-Axel Zagadou would mistime the flight of the ball, Son Heung-Min peeled away from his marker to direct the it past Bürki. Vertonghen, so crucial to the game&apos;s opener, was even more involved in Spurs&apos; second as he hit home a Serge Aurier center, the Belgian defender clearly revelling in his role as a makeshift wingback mandated by a mini Tottenham injury crisis. By now Borussia Dortmund had retreated into themselves. Chelsea-bound Christian Pulisic struggled with the physicality of the English side&apos;s defence (a sight which will raise pulses at Stamford Bridge ahead of the American&apos;s arrival in London this summer) while Sancho, so impressive in the first, was last seen being outmuscled by a menacing Sissoko. A third from late substitute Fernando Llorente made the final score 3-0 and served to emphasize what we had witnessed in the previous 40 minutes or so: this Tottenham side will take some beating in this season&apos;s Champions League. A late strike from Marco Asensio and a 60th Champions League strike from Karim Benzema, with a Hakim Ziyech strike for Ajax sandwiched in between, saw the champions begin their defence but they appeared anything but the well-oiled machine they may have been in recent seasons. The home side were controversially denied a first half lead as what looked like a fair strike from Nicolas Tagliafico was ruled out after referee review in the first ever use of VAR in the competition. Ajax managed an impressive 19 shots on Thibaut Courtois&apos; goal and the manner of the late loss, as well as VAR heartbreak, could embolden the group to try and take the game to Real Madrid in the second leg at the Santiago Bernabeu. Published on Wed, 13 Feb 2019 22:43:00 GMT, © All rights reserved by the publisher.